New Yorkers get an early peek at Nintendo 3DS at the South Street Seaport. You can’t buy it until Sunday, but dozens of New Yorkers have been getting their hands on the hotly awaited Nintendo 3DS portable game console thanks to a roving band of Nintendo representatives. At Manhattan’s South Street Seaport Thursday, a group of white-clad Nintendo product demonstrators showed off the dual-screened 3DS , which can display 3D images without the need for 3D glasses, to whoever cared for a short demo. From there the Nintendo team headed to Union Square, which will be the site of one of ten 3DS launch parties at Best Buy stores nationwide Saturday night. Want more information and more pictures? See my piece for PC World. Are you eco-conscious? Do you care what your cell phone is made of? Sprint certainly hopes so. Last week, at a well-attended press event at the Cooper-Hewitt, National Design Museum in Manhattan, Sprint introduced the Samsung Reclaim, a phone made of 80 per cent recyclable material. Two dollars from each purchase goes to the Nature Conservancy’s Adopt an Acre program. How does it rate? Read my review at PCWorld.com. Make it work, make it mine, make it easy: Those are the three customer wishes T-Mobile aims to fulfill with its new flagship smartphone: the myTouch 3G . 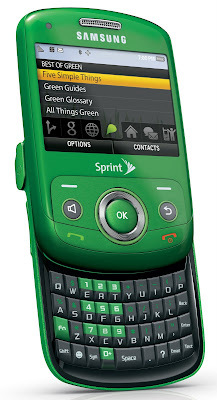 The touchscreen smartphone, manufactured by HTC and based on the same Google Android operating system software as the T-Mobile G1, offers a slimmer profile than the G1 thanks to its lack of a slide-out keyboard. Highlights of the new unit include its large library of Android applications and the multitude of ways in which it can be personalized. Brodman said there were already 5,000 Android applications available for the myTouch 3G and the G1, including many location-aware utilities that take advantage of the GPS receivers built into the phones. For example, Sherpa, from Geodelic Systems, can locate points of interest close to you as you move around. Clicking a restaurant button will generate icons for the closest eateries, complete with the addresses and the distances from where you are. Click on an icon and the phone searches for relevant information on the restaurant, such as menus, travel directions, cuisine and reviews. Rahul Sonnad, founder and CEO of Geodelic, said Sherpa was first developed for PCs, but was ported to Android as the software platform gained traction. Brodman described Sherpa as a “really unique recommendation and discovery engine. He noted that it remembers the user’s preferences as it processes requests. “The more you use it, the smarter it becomes,” he said. Brodman said T-Mobile’s sales force had been trained to help users set up and personalize their myTouch 3G phones. “Make it work, make it mine and make it easy,” said Brodman, taking the role of a prospective customer. 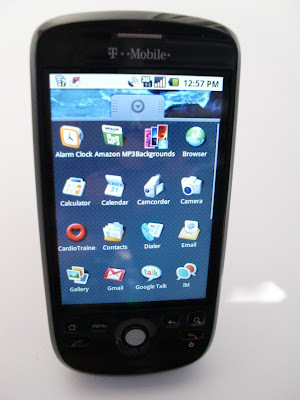 Current T-Mobile customers can pre-order the myTouch 3G for $199 with a 2-year service plan. Those who order by July 28 will receive their units by Aug. 3. The unit will be available in T-Mobile stores Aug. 5. The myTouch 3G offers a 3.2-inch touchscreen, aWi–Fi adapter, a 3.2-megapixel digital camera, a digital music player with a preinstalled four-gigabyte microSD memory card and support for T-Mobile’s fast 3G data network. After few minutes of testing, the phone worked well. The touchscreen was responsive and the Web browser rendered pages fairly quickly. The on-screen keyboard, which can be set up to give tactile feedback when a key is touched, flips over to the side when the phone is held in landscape orientation. Post said the myTouch 3G was poised to be a viable challenger to Apple’s iPhone to date. Time will tell. WirelessInfo.com, a new web site covering the ever-changing wireless industry, launches today. I’ll be one of the bloggers there bringing you the latest news on new cell phones and accessories, new mobile technologies and other useful information. No, The Paper PC isn’t going anywhere. I’ll continue to bring the latest in consumer electronics and personal computing to this blog. I’ll just be spreading myself a little thinner.